Advertised as a high paced international thriller, No Escape hardly delivers on the good trailers it put out. In retrospect, the film isn’t even an international thriller; it’s a zombie film. Not the traditional zombies of sorts, but still nameless, faceless, and ruthless killers who constantly chase our film’s protagonists to no end. No Escape is quite a simple piece of film and while it features some good performances, just can’t get passed the clichéd, and slightly racist, story. 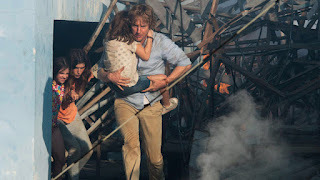 Jack Dwyer (Owen Wilson) has been relocated to a new job in Southeast Asia, bringing along with him his beautiful wife Annie (Lake Bell) and two daughters (Sterling Jerins and Claire Geare). Less than twenty-four hours after their arrival, they find themselves caught in the middle of a violent revolt that leaves them struggling throughout a life or death situation. 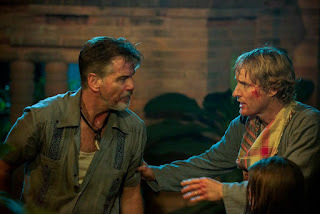 As far as story goes, No Escape doesn’t put much out there, but it fills the runtime with a basic escape despite the title telling you there is none. There are certainly some tension filled moments throughout the 103-minute runtime, but often bad editing detracts from those moments. A random slow motion scene here or an abruptly changing weather pattern there and it is clear the editing is jumbled and in the end a little jarring. One compliment No Escape will gladly receive from me is that the Dwyer family actually felt like a family. The chemistry between the two leads, Wilson and Bell, was certainly needed to boost the drama. While the family is a believable unit, it’s clear from the start that nothing truly terrible is going to happen to them. There are a few scenes where everything seems lost but in the end you know everything will work out. One in particular involves the criminally underused Pierce Brosnan as the British man, Hammond, who conveniently shows up at all the right times. The acting is actually pretty well done for the roles each actor was given. Pierce Brosnan, though underused, is well cast in the role of the British expatriate. Owen Wilson works well in a grittier role than he used to, though his character could use a little more fleshing out. Bell is serviceable enough, partly due to her lack of material and often given nothing to do but react to the scenes before her. Some of the character’s decisions don’t always make sense either. However, I will say that Jack Dwyer has a cleverer mindset than just attack and the filmmakers thankfully didn’t make him an automatic action star like many other films would. But besides the few smart choices, Wilson’s character makes an equal amount of bad ones. One in particular involves the entire Dwyer family on moped riding straight through a mob of rebels who want to kill them. Yeah doesn’t make a whole lot of sense. So what did you think of No Escape? Have you seen it, are you interested in seeing it, or is it just not the escape you're looking for? Sound off below with your comments or feedback and remember to come back for weekly reviews.